Today, I bring to you a cheap homemade dog food recipe that you can try right in your kitchen. You may want to try making your own dog food, may be because you want to avoid buying some expensive dog foods or your dog is allergic to those foods you get from the store. Some dogs are allergic to some foods and you may want to try something different. So you have come to the point where you want to make dog food yourself – making dog foods are quite easy and not very far from what we eat. So today I am going to tell you about a recipe that I use that’s very nutritious and most dogs like it. It might be wise to consult your vet before you go ahead because a little advice from your vet can sometimes give us direction that’s best for our dogs. You should also note this: A sudden change in your dog’s food can cause him to go sick which is not what we want to happen. I t can also affect your dog’s appetite so you take the process slowly. Introduce the new food in small quantity together with the food he is use to as time passes you can give him more of the new food when his stomach gets use to the new food. Chicken, kidney, beans, carrot, butternut squash, groundnut (peas), white rice and green beans. You can replace some of the incredients with some equal matches like buying meat such as turkey and hamburger. The vegetables can also be replaced with equivalents. You can also add chicken livers and egg shells which should be added in small quantity. Like many vets woulkd recommend, you can give your dog VetriScience 02666400101 Composure Pro. This is also given to dogs when given the store foods. Did you wonder why white rice was recommended specifically? The reason is that white rice effect is easier on sensitive stomach than brown rice. To make things easy to manage, you can cook a lot at once then you divide it equally into bags and store it in the freezer. In the morning you bring a bag and divide into halves and defrost one half and add little water which make it more soft but do not make watery. The smell of it should make your dog wag his tail in expectancy. 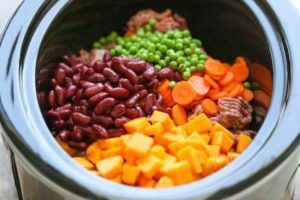 Most dogs are in love with this recipe but if your dog shows signs of stomach problem you can omit the beans. This should make everything just fine for your friend (your dog). Love this easy cheap homemade dog food recipe? Remember to share with family and friends.